My heart wants me to be a quilter. Like yearns and pines to be a quilter. My brain and my attention span have other ideas. I am in awe of people who whip out a gorgeous quilt in a matter of days. Heck I am in awe of someone who finishes a quilt in a month. Up until this point I have really only sewn one quilt. My second "quilt" really wasn't a quilt at all. Each time I learned something new, but I still didn't really feel like I had a clue what I was doing. Plus, lining up those dang pieces so they match perfectly is really hard. Quilting is a really daunting endeavor for me. That might explain why after buying the fabric for this quilt, it took me two years to start this quilt. Notice I didn't say make. I couldn't seem to get the courage to make it. I finally decided that this year was the year I would make it. 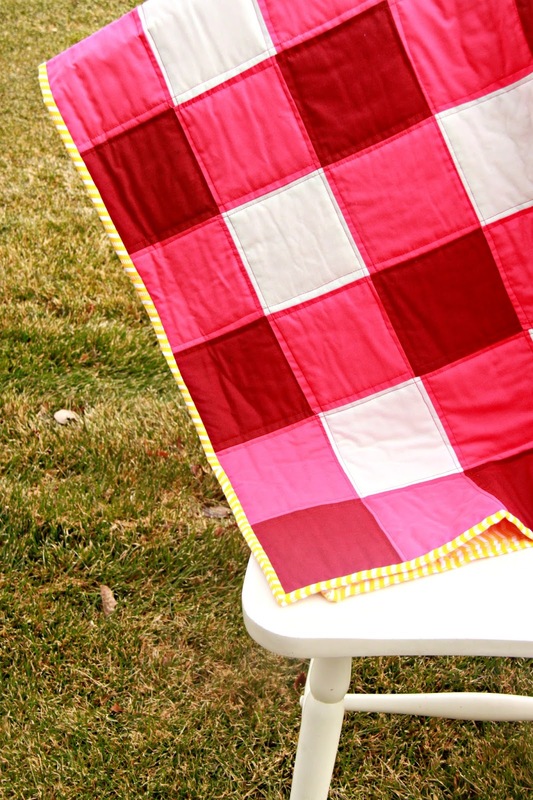 I had seen a "gingham" quilt on Pinterest a few years ago and instantly fell in love with it. 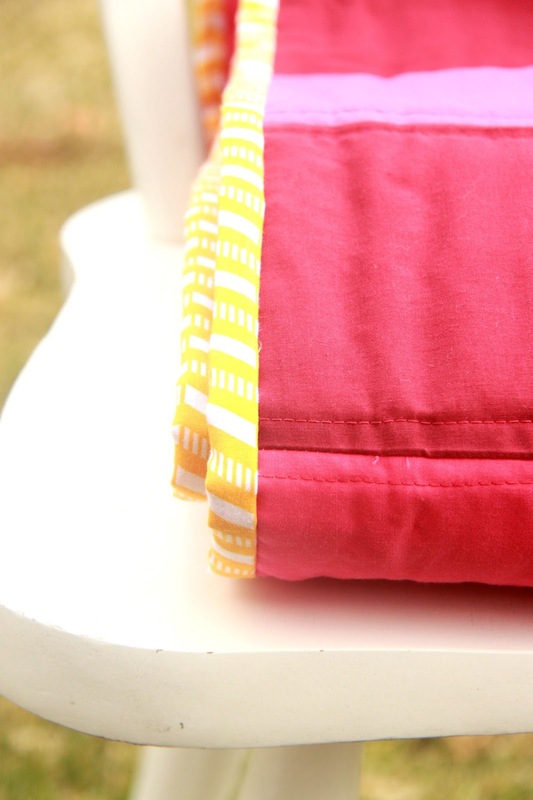 I bought white fabric and two coordinating shades of pink. I bought a lighter and darker shade. I cut out a lot of squares and arranged them in a dark pink/light pink pattern and a light pink/white pattern. This way once arranged they made up a faux gingham pattern. 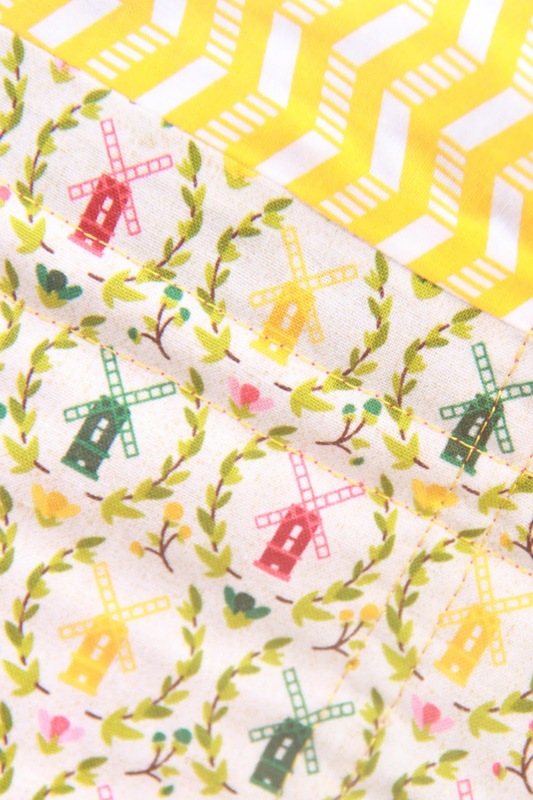 I found this adorable Dutch inspired windmill fabric to go on the back. I didn't quite have enough for the entire back. Remember that whole I bought the fabric years ago and only now started making it. I hadn't calculated right. Okay so basically I just guessed how much I would need. Hence that whole, my brain isn't meant to quilt. Fast forward a few years and I can't find anymore of this print. I wasn't too worried about it though because I was planning on finding a print to make the binding out of. This way I just got the same print to make binding out of and to add to the back. Some firsts for me with this quilt. I used spray basting. Huzzah. It was amazing. It made it SOO much easier to assemble. I used all the helpful information I could gather from Diary of a Quilter. She is kind of a genius and I wish I were her. I also made and used my own bias tape to bind. ALSO I actually hand-sewed the binding. Say what? Yep. Well at least the front side. I have never done that before. It took awhile, but it was definitely worth it. 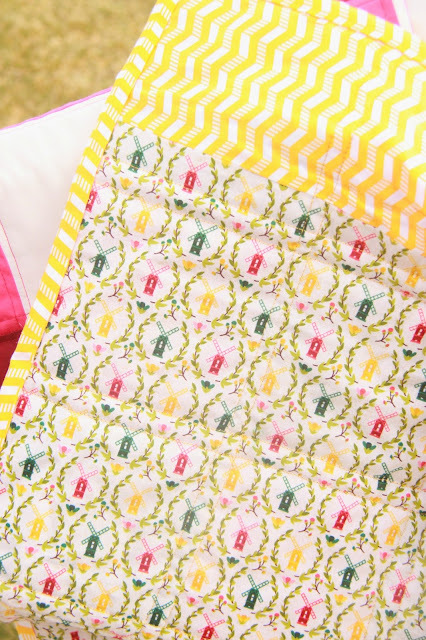 My heart really, really wants to make another quilt pronto. Alas, my brain is already screaming just thinking of all the precision and calculating. So it might be another two years. Haha! Your quilt looks wonderful! A job well done! I love the colours you selected. This looks great! 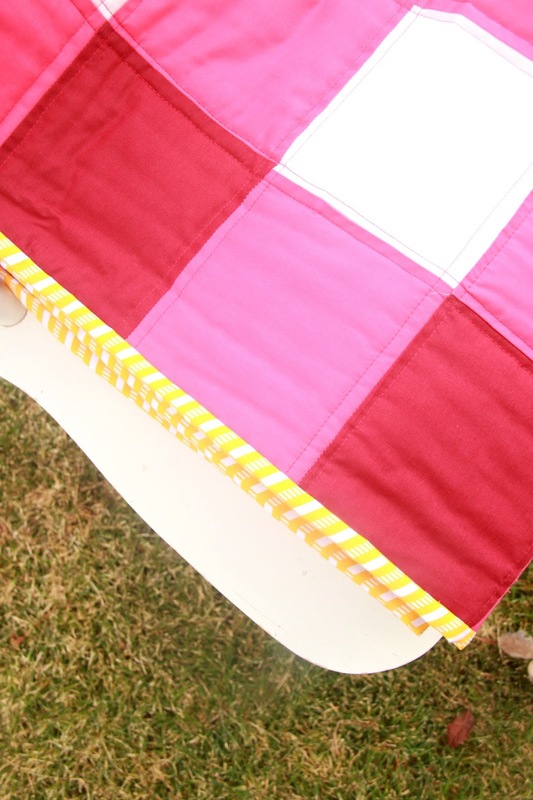 I also have a gingham quilt in my to-make pile. I think I bought the material FOUR years ago, though, so you're cookin'. :) Great job on the hand binding, too. I've never had the patience, but you've inspired me to try. It is beautiful! Your eye for color is wonderful. You are super talented sweet daughter of mine! The yellow with the pink is divine! Well done. Thanks Ladies!!! Kelli, if I can do it, you can do it. I promise. A comfy couch, a good tv show and it flies by...relatively.HAHA!